One of the more important items on a Military Retiree's To-Do list is his/her VA Disability Claim. This process can have a profound financial impact on military retired pay, thus it deserves the keenest attention to detail. I do not claim this article represents all there is to know about a VA Disability Claim. There are millions of military retirees in our great Country - each who had a unique personal journey through the VA's Disability Claims process...which may differ greatly from what's described below. 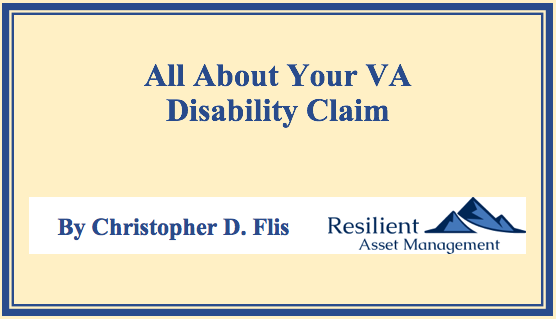 My intentions here are three-fold: (i) make all prospective Retirees aware of what a very big deal the VA Disability Claim is; (ii) provide details on the process; and (iii) provide resource to fill in the blanks in a Retiree's unique VA Disability Claim story. I don't allow BLOG comments on the website for regulatory reasons. Therefore, if you find factual errors of have suggestions for edits, please e-mail me directly at chris@resilientam.com. The foundation of the United States' commitment to Veterans began all the way back in 1636. At that time, the Pilgrims were in conflict with the Pequot Indians. Recognizing the dedicated service provided, the Colonists passed a law providing for the supporting of those "wounded in action". In 1776, the Continental Congress followed suit by providing pensions to those wounded in the Revolutionary War. 1811 brought the first Veterans medical facility with the Civil War later influencing the construction of Veterans' homes. Fast forwarding toward the present day, the Veterans Bureau was founded in 1921. This government organization consolidated all Veteran Programs. President Herbert Hoover later elevated the Veterans Bureau to a federal administration, which spawned the Veterans Administration we know today. More simply put, VA Disability Compensation recognized the hazards associated with Military Service and the tremendous sacrifices member of our Military make during their careers. The Disability Compensation process, while imperfect, provides a direct monetary benefit to the afflicted, and rightfully so. The mechanics of the VA Disability rating (further described below) are to assign you a disability rating based on the list of your service-connected ailments. Then, you are compensated according to a VA Disability Pay Scale, also described below. Transition Class. Typically, A prospective Military Retiree will attend a transition class about a year out from retirement. Many topics are presented in this forum, among which is the application for a VA "eBenefits" account - this is simply a must-do for every retiree as this the conduit through which you can check the status of many things, including your VA Disability Claim. 90-180 Days Prior to Retirement. The VA allows those on active duty to submit disability claims 180 days prior to retirement, not sooner. This time frames allows for necessary medical appointments to evaluate your condition and ultimately assign a disability rating. Given that VA Disability compensation is intended for service-connected disabilities, applying while on Active Duty obviously establishes this basis. The VA Disability Claim Form is VA Form 21-526. This form may be submitted my mail, in-person, or electronically via eBenefits. You will also have to submit a copy of your DD214 (separation or discharge paperwork) for all the time your served in the Military. And finally, you must include copies of medical records and other documentation substantiating your Disability Claim. Direct Service Connection. This occurs when you r disability occurred directly as a result of your military service. For example, a damaged vertebrae caused during an aircraft ejection. Aggravated Service Connection. This occurs when you enter service with a documented pre-existing condition that is later aggravated by your Military Service. Presumed Service Connection. These afflictions are defined by Federal Law and are presumed to be service connected. The list consists of chronic illnesses (ALS, Parkinson's)...if you have them while on Active Duty, the Military will undoubtedly advise you on your Disability Benefits. When you are diagnosed with your various ailments, each will be assigned a numerical value as a percentage between 0 and 100 percent. You can have multiple rated ailments. Up front, this is confusing, I mean very confusing. The calculation is an iterative process. For each iteration of the calculation, you are assigned an Efficiency Rating and a Disability Rating. The starting point is 100% Efficient. For your highest value ailment, you simply deduct that number. In the example above, that would be 40%. If that were your only ailment, you would 60% Efficient and 40% Disabled, resulting in a VA Disability Rating of 40%. However, you have 3 more ailments to consider, so the math is the same, however, the starting value is now 60% instead of 100%. 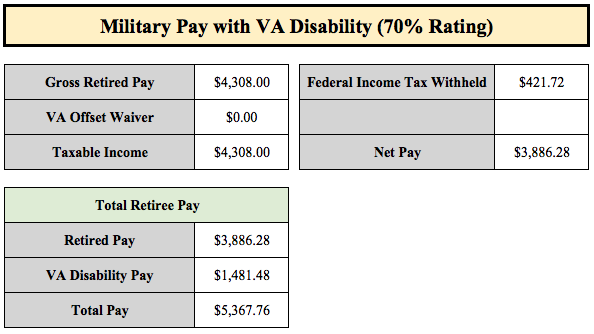 Note: The VA will round up at 5%, thus 55% equates to a 60% disability rating. There are numerous calculators out there to make this calculation, so please use one if my explanation is confusing. Moreover, the VA does this computation for you when you receive your notification deciding your case...check their math if you like. One of the biggest misconception about VA Disability Ratings is that you receive a percent of your retired pay tax free that is the percentage VA Disability Rating. For example, if I am 40% rated, I receive 40% of my Retired Pay Tax-Free. This is absolutely false. The truth is that there is an entire pay scale for VA Disability Pay. The scale you use depends on your overall rating, marital status, and the number of dependents you have. You can see the entire pay scale here. Whether you are an O-10 or an E-1, your Disability Pay is exactly the same for the same disability rating. For the 70% Example above, if we assume the Retiree is married with no child dependents, his/her Disability Pay would be (in 2018) $1,481.48. To reiterate, this amount is completely independent of rank. Technically, the Defense Finance and Accounting Service (DFAS) refers to this amount as your Concurrent Retirement Disability Pay (CRDP). This is another area of misunderstanding. I will attempt to simplify the explanation as much as possible. Of note, the $666.90 is tax-free. 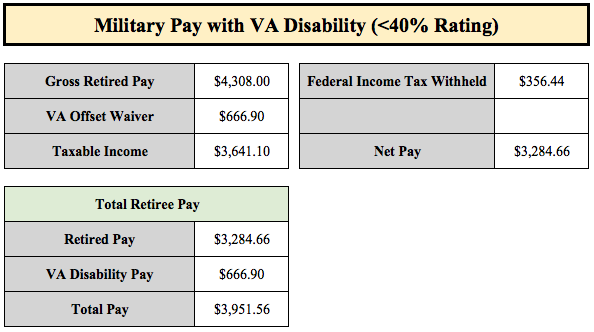 Of note, the $1,481.48 VA Disability payment is tax-free. Time is of the essence on a VA Disability Claim. True, you have up to a year to make most claims; however, why play that game? Make your Disability Claim an item on your pre-retirement checklist and get the ball rolling early...the VA is a huge monolith, so claims processing takes time. The VA will consider as many items as you claim, so thoroughly examine your medical record for all ailments and make whatever claim you think your medical record will support. Upon retirement, if you are not already aware, you soon will be that there are a plethora of organizations in our United States actively supporting our Veterans. Among the many services these organizations provide, assistance with VA Disability Claims is one of them. You can search for one near you here. Or even better, talk to other senior military folks who are at or near retirement and they can provide you some local "gouge" on what to do and to whom you should speak. The devil is indeed in the details with your disability claim. Check eBenefits rhythmically to update yourself on the progress of your claim. If more information is required of you, eBenefits may be the only place where you are notified. The VA Disability is a huge deal for many Military Retirees with potentially hundreds of thousands of dollars in tax-free pay in the offing. Therefore, any prospective Military Retiree should become intimately familiar with the process and seek out assistance with filing an accurate and complete claim.